The 2014 BMW i8 is an all-new model and it looks like a futuristic concept that you would see on the floor of an Auto Show, but luckily for us, it is already in production. The sleek styling of the BMW i8 is unlike anything to come before it, and standard 20-inch wheels and U-shaped LED headlights ensure that heads will turn and jaws will drop. The only thing more revolutionary than the 2014 BMW i8’s design is its powertrain; the i8 is powered by a turbocharged 1.5-liter three-cylinder paired with an electric motor and a lithium-ion battery pack. The combination pumps out an immense 362 horsepower and 420 lb-ft of torque, which propel the i8 from 0-62 mph in just 4.4 seconds. The revolutionary powertrain is not only high-performing, but remarkably efficient. The 2014 BMW i8 is able to travel up to 22 miles on pure electricity, and can be fully recharged in just three hours by a regular outlet. 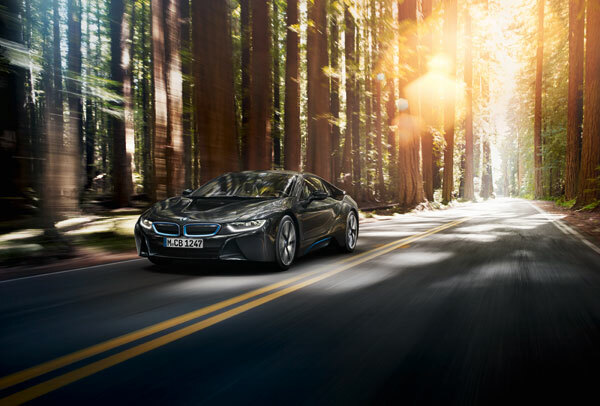 When it is not functioning in electric-only mode, the 2014 BMW i8 returns an unheard of 112 mpg. If the exterior of the 2014 BMW i8 is like looking at the future, the vehicle’s interior is like stepping inside it. The upholstery is comprised of leather and recycled materials throughout and carbon fiber combines with unique 2+2 seating to deliver an unrivaled occupant experience. 3D high resolution displays are used to deliver vital vehicle information.